Sources of digital data that could benefit the healthcare industry have exploded since 2010. These data can be consumers’ socio-economic status, attitudinal and perceptual beliefs on health and wellness, shopping behaviors, self-care activities, and personal health data collected through interactions with connected devices, credit scores, locations, and even daily routines and social media activities. Another potential treasure trove is human genomic data that shows how predisposed a consumer is to diseases. Clinical decision support: Help doctors understand a patient’s health status and progress in both absolute terms and relative terms compared with other patients with similar diagnosis and conditions, or guide doctors to intervene at the optimized time in patient care. Population risk stratification: Help health systems and payers better understand the risk profiles of their customers or members so as to develop effective engagement and treatment strategies for population health management. Quality gap analysis: Help a hospital or a physician practice understand how well they deliver care in compliance with quality standards and use evidence-based guidelines. They can identify the quality gaps and develop strategies to close them. Population behavior simulation: Through predictive analytics, care providers can simulate the characteristics of patients, their behaviors, their providers, and what impact these factors can have on their utilization of health resources and care providers’ performances. Similarly for payers, this simulation capability can help insurers understand how their claim cost will change as the mix of insured pool changes and how interventions like population health management can impact cost curves. There are hurdles to overcome before these patient data use cases can be fully developed/designed and implemented. For instance, consumers are still not comfortable in sharing data with care providers and care providers are concerned about junk patient data and liability associated with data sharing. These challenges will be addressed by the health industry from regulatory, technology and financial angles over time. 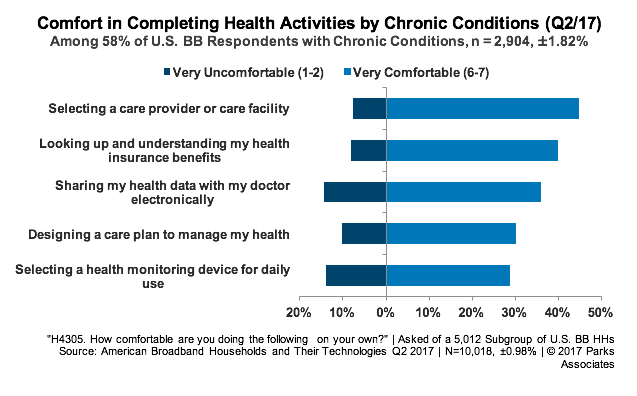 Parks Associates will address these issues at the fourth-annual Connected Health Summit, Aug 29-31 in San Diego in an interactive session, The Business Case for Patient Data: Optimizing Healthcare Experiences.